If you read my last post about the update here, you’ll have a better idea of what is going on, and why you might be noticing huge changes in your followers interaction on Instagram. I’ve been doing some heavy research on the matter. Some people out there might want to keep the information to themselves, but… I love you guys, and I want to help! So hopefully you get a lot of great insight from all that I’ve learned and am sharing here! If you find it helpful, maybe leave a comment below, and share the link to your page! I always check them out. So let’s be honest, we all worked really hard throughout the years on our Instagram personality, and it’s an ongoing task. Building up a unique following that is interested in us and what we do is sort of the reason for Instagram. Now that everything is about to change (and for a large percent of users it has), it might seem like the sky is falling. I may or may not have had some panic attacks in the last couple weeks, wondering if everything I built would be lost like eggs in one basket. Instagram has become very important to a lot of us, being sort of the center of the spider web that connects to all the other strings of media and content we share on the web. Those of us who haven’t succumbed to buying fake followers and fake likes, rely on our business savvy planning and creativity to reach our audience. But with a chunk of our followers not seeing our content (the reason I left Facebook years ago), it means we are going to have to work EXTRA EXTRA hard now to keep up what we have built, and keep connected with our audience. 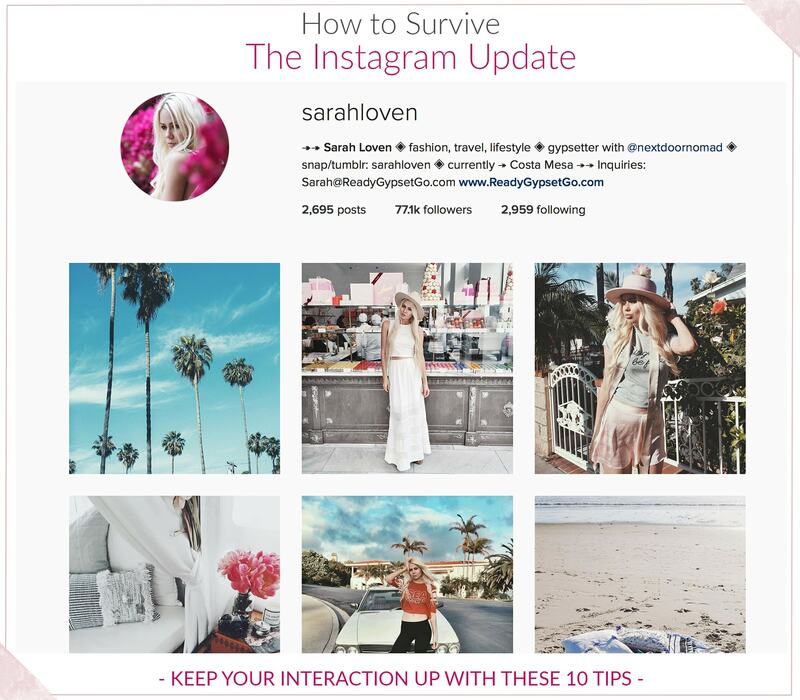 Below I’ll be sharing the most reliable tips for surviving the impending Instagram Apocalypse. Tale as old as time, us human beings are interested in each other. We just have to put a little (or in this case, a LOT) of effort out there. Take the first step, spend time on Instagram just exploring, liking, and commenting on photos from people in your genre. That is the first sure-fire way to get your content in front of other people out there. Usually, people will check out your page and return the kindness with a like and comment back. If they love your content, then they may even follow you! Though this works great on a small scale, it’s a hard task to keep up on the daily when you may just want to go live your life instead, and forget about social media! This is why some users have resulted in buying their likes and comments- a practice that is sort of the cause of the problem in the first place. One other way to keep the interaction up on your posts is to return comments. Respond to their comments when you can, a simple thank you, and keeping up the conversation goes a LONG way. It keeps you on their radar, you can remember to check their latest posts, and vice versa. Just the same, be polite and go like one of their photos or leave a comment. You want to be human, and show that it’s not a one-sided relationship! It may be harder for bigger accounts to keep up with this, but just doing it as much as you can just wins you more Insta Karma. And we could all do with a little more of that! And don’t compare yourself to other accounts. These days as the app has aged quite a bit, it may be hard to judge how many comments and like you should be getting, compared to other accounts. So you have 100k followers, if a large chunk of those are followers from 1-2 years ago (such as my case), then they might as well not even exist. People create accounts on a whim, but that doesn’t mean they keep using them. How many account have you forgotten about? If you’ve been around for a while like I have, you probably have a lot of ghost followers (inactive accounts). This is just another reason to not put a lot of value on the number of followers you have. Keep in mind, newer accounts are going to have more interaction, with a fresher collection of followers. The downside to being new, you’re account has to prove itself more to Instagram, while active aged accounts are sort of trusted more as “real” and not bot accounts. Okay, this is a big one. We may not even know who we are in this world, but on Instagram it is very important! Why? Well it all ties into your “branding”, and then determines who your audience is. With all the changes coming up quick, you’ll want to get this all figured out as soon as possible. Ask yourself these questions, and maybe spend some time writing down some ideas on paper. Who are you to your followers? What personality are you putting out there to them? Are you connecting with them and creating a relationship? Why are they wanting to get to know you, and continue to follow your daily posts? What is your theme? Are you a travel photographer who inspires those who have wanderlust in their hearts? Are you a writer who types poems onto napkins and gets people to relate to you? Are you a blogger who influences your followers in the realm of fashion, merchandise, food, travel, lifestyle, etc? With your theme, how do you present it on your feed? Do you have a color scheme? In a world where everything is about presentation, first impressions are important. Use your feed to translate exactly who you are, and why people who like what you do should be following you. If you don’t know what you’re doing, and are constantly changing your content, people will be lost and probably unfollow you. At the very least, stye will not feel connected to your content. Staying consistent is important. Narrow down the reasons people may follow you so you know you can dedicate a lot of your work towards staying consistent. This is also important. You may have collected a large chunk of followers in a certain age bracket who appreciate what you post. Whether it’s teens, young adults, or specifically adult women, you’ll not want to go changing it up on them and scaring them away. I, myself, have experienced the difficulty of this, being an artist with changing passions and tastes. I used to live in the desert and post mostly edgy, adventurous desert content. But with my travels, I’m constantly shifting its my inspiration. I went from boho to beachy resort, which some people may lose interest in. Similarly, I may keep things rather family friendly 80% of the time with my content, but I still get all artsy once in a while and can post more “mature” content. Some people don’t expect this, and it can upset them and scare them off. I could take it personally, but I just have to accept the fact that art sometimes makes people uncomfortable, and it’s going to happen here and there. But generally, you can decide for yourself where to draw the lines, to stay within your niche for the comfort of your followers. As a business you want to make the best choices, but it’s still your profile and you can post want YOU like. It’s true, people tend to want something from others. You don’t have to treat it like a shallow thing. You can provide something to your followers that they want, whether it’s material or on a deeper level. Giveaways… is that something that your followers would appreciate? Freebies? Tips and advice on your tricks of the trade? Information? Inspiration? Spiritual guidance? Or just an escape from the mundane? This goes along with your image, and knowing your audience. Know what you have to offer them, and GIVE GIVE GIVE. Everyone wants to feel fulfilled. This may only apply to content creators, talent, and brands out there, but uniting together and helping each other out is one big way to keep getting fresh eyes on your content. Collaborating, working together, and sharing each other’s photos shares your followers with each other. And don’t worry, you can’t lose followers by cross-promoting, just share them! Though some would believe that they can’t even mention the names of their “competitors” in the case they lose their followers to them. Guys… in a time like this, we all need to be working together! Getting your content out there through as many platforms as possible! This is a very interesting aspect of social media these days. This next generation who makes up a majority of social media consumers, aren’t so much interested in how perfect your “life” can be. They want to see real people, things that show who you are, what you have to say, and what your real life is like. People want to feel like they can relate. This even goes to an extreme, where they care less about that artistic photo you took with your professional camera, and prefer a decent iPhone photo, or Snapchat videos. I can see where this makes people more human, but it’s definitely hard for a person like me to shift into this new phase of social media. I’ve worked for years to perfect the quality of my work as an artist and photographer, and I personally am attracted to good quality photos. But when people are more interested in real life, it may be something important to keep in mind when planning your posts. Post more BTS, more daily life stuff. Tell a story about your day, don’t just put some emojis in your caption and pass off on being a human being. Ask your followers questions, speak your heart. You’ll probably get more feedback than you think. It’s going to take time to see the results you may have been used to before the update. Time invested in interacting, and time waiting for people to see your comments and get back to you. For example, I can spend an hour on Monday commenting on other blogger’s posts. By Tuesday morning I see a decent amount of return traffic. If I don’t spend time interacting on Tuesday, Wednesday shows a slight drop in interaction, and by Thursday it’s dead again. I practically hear crickets. Why? Because IG isn’t using the same algorithm to put your content out there, whether to your own followers or on the Explore page. They are trying to avoid promoting the bots and fake accounts that use black hat methods to get onto the Explore page. So YOU have to be the one putting yourself out there, unless you want to start paying for Ads at X cost per like. Might want to put a poster on your wall to inspire you- “Dreams don’t work unless you do.” Time to get to work, babe! You CAN share your Instagram posts to other platforms, whether from their share function within the app, or other means. This is another way to keep your content out there and circulating. Just be sure you have direct links going back to your posts, as the goal is to bring the traffic back to you. Instagram may have once been a crutch for your other social media sites, being the top interaction platform out there for the last year. But now it’s going to need some help instead from all the other platforms you use. Too much of a good thing becomes a bad thing. Instagram may be a social media platform, but it’s best to do some things in moderation, such as posting photos. Not enough and your followers might forget about you, and too many and they might unfollow. It’s a balancing act, and you’ll want to do some testing with your posts to see what works best for you and your audience. This also applies to your content. Too many selfies, or too many palm tree pics, and people might start to get annoyed. Balancing your feed with a blend of different types of photos is the best way to create a visually appealing feed. You also want to moderate the amount of comments and likes you post in a row, or in the hour, for example. Instagram keeps a graph with your comment and like interaction over time, and sort of “knows” when you’re not behaving like your usual self. This, if you ask me, is a little ridiculous. But it’s all to prevent bots from taking over the app. So don’t act like a robot, and you’ll be okay. You don’t want to be suspended from commenting for a week. Okay, I’ve mentioned this in my 10 Tips for a Better Instagram post, but now there is even more reason for me to talk about it. Wether you are aware of accounts who buy fake followers/pay for likes and comments or not, it is one of the big downfalls of Instagram. When Instagram is about being social with other users, and IG has to start blocking, deleting, and flagging accounts who use hacked methods to cheat the system, it sort of ruins it for all of us. Not to mention, tricking your potential clients into paying you for fake exposure, whether they believe it or not, makes it harder for honest content creators to get work they are worth. But, even more importantly, the new IG algorithm is reading your account more carefully. Accounts who fake it have a high chance of being flagged as a fake account, or pinned as someone who is using black hat methods. The algorithm keeps a chart of your interaction, down to the amount you comment and like, to the types of accounts interacting on your posts (such as fake bot accounts that are used for paid comments/likes.) If your account gets flagged, you lose the chance to be on the Explore page, and IG takes precautions, restricting your interaction even more. This may result in people not being able to caption tag your username, not being able to find you in the search bar, you might be blocked from commenting for hours or days, and your account could end up suspended for time or even deleted if you go too far. So again, I encourage everyone to just BE REAL, and use Instagram the way it’s supposed to be used, and therefore protect it from going further down the drain. Don’t spoil it for everyone else, and don’t risk your account either. If you want lots of comments complimenting you, maybe make some real relationships with other people out there, and you’ll get real comments back. It’s all the more worth it when it’s real and you earned it. So I hope with my last 2 posts, covering everything from the issues with the Instagram changes and how to deal with them, you’ve gotten some helpful insight on how to survive the Instagram Apocalypse. Maybe it will just be a phase as they handle the new algorithm and make adjustments, or maybe it will be a permanent side affect. We don’t know at this time, but we just have to keep pushing forward and make the best of it! You’re not alone! I appreciate your realness with this post. You covered several things here. Interaction is crucial to really see anything pick up for anyone’s IG account. I think a lot of times people get overrun with trying to do too much at one time and then get burned out. One of the best pieces of advice with social media is to plan ahead and stay consistent. The more consistent you are the easier it will be to stick with it. Keep up the good work!